This exclusive image shows 27000 from a point of view that simply cannot and will not be viewed again. 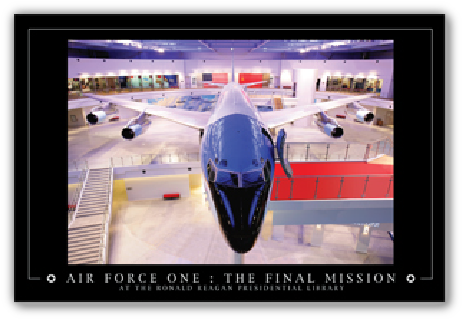 It shows the beauty and elegance of form of this Boeing aircraft, sitting on its perch, and presiding majestically over its one-of-a-kind pavilion at the Ronald Reagan Presidential Library. This large size, high quality lithograph is clearly suitable for framing. With its high gloss UV coating and measuring 24” X 36”, this print will fit in a standard size frame. Printed proudly in the USA.